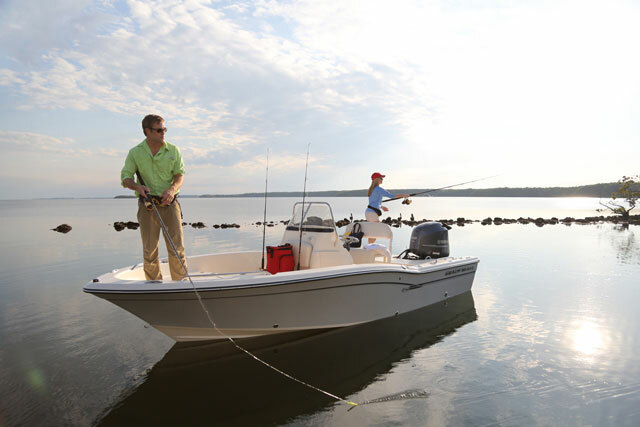 Fishing from the new Edgewater 368CC center console, you’ll feel like you rule the ocean. And you will. 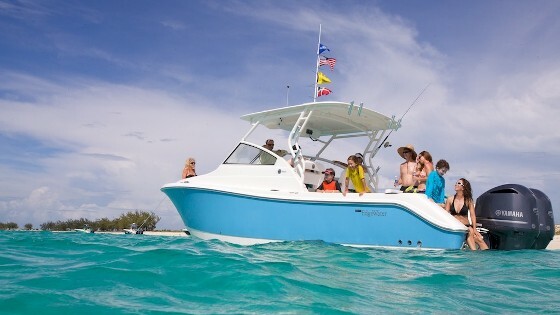 We’re blazing through the water with the Miami skyline blurring past and triple Yamaha F300 outboards roaring astern, when the captain yells “hold on tight!” and cranks the wheel hard-over. 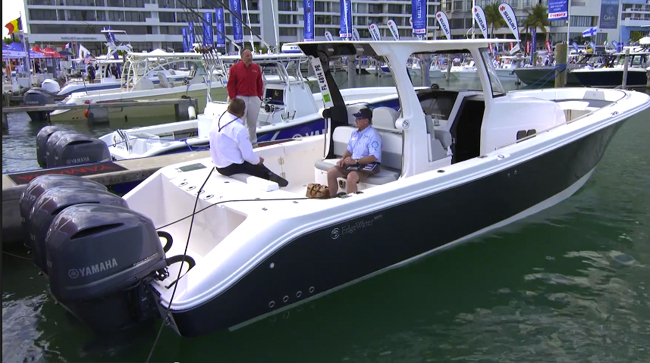 With the agility of a cat (the animal, not the boat) the twin-stepped, variable-degree deadrise hull latches onto the water’s surface and whips around in a 180. We smother our own wake beneath 8,200 pounds of fiberglass without so much as a bump or a thump, feed those Yamahas more oats, and break 65 MPH. When the captain backs off on the throttles, there’s only one thing going through my mind: My turn! My turn! Gimme the wheel! The new Edgewater 368CC: Let me at it! Big, bodacious center consoles burst onto the scene a few years back, and today they’re more or less commonplace. 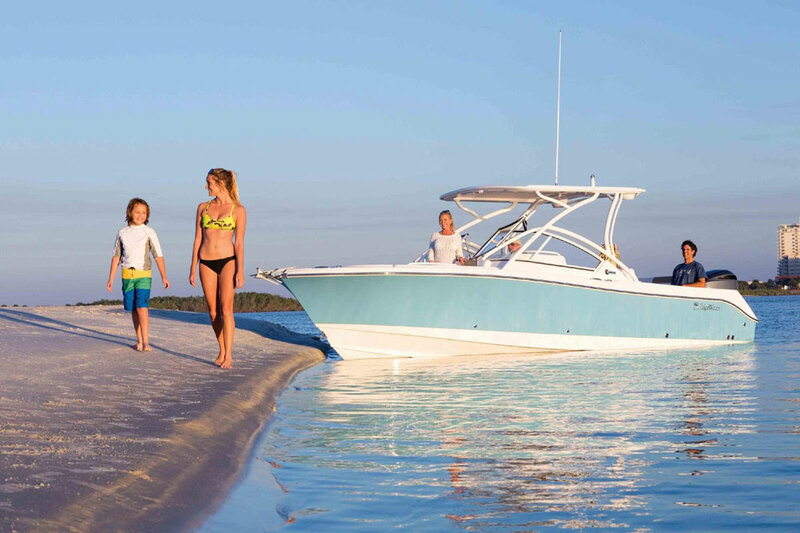 In fact, by today’s standards the 368CC isn’t particularly huge; center consoles like the Boston Whaler 420, the Everglades 435cc, and of course the whopping-big Hydra-Sports 53 Suenos have set a new bar for just how big an open fishing boat can be. 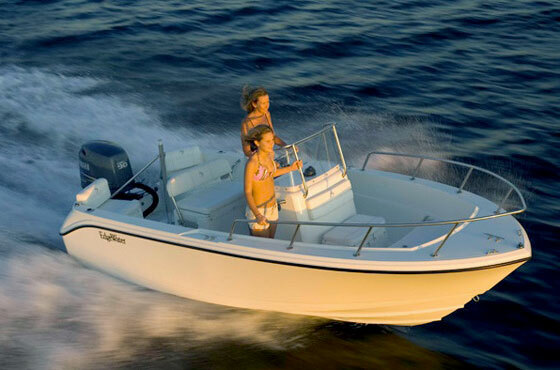 What’s not commonplace among this genre of boat, however, is the hot-rod handling and performance the Edgewater offers. Part of the reason is that variable-degree deadrise hull design, sure. But another factor is how Edgewater builds their boats. This company has long been at the forefront of fiberglass molding techniques, and the net result is a stronger, lighter boat. Let’s compare weights. The 368CC tips the scales at 8,200 pounds. The Everglades 355T comes in at 9,500. The slightly smaller Belzona 325 weighs 11,300 pounds. And the slightly larger Contender 39 ST comes in at 15,400 pounds. Getting the picture? A prime example of the weight savings can be found in this boat’s integrated carbon-fiber hard top. Like other parts of the boat, it’s built with resin infusion. That makes it super-light, which helps lower the boat’s center of gravity, thus enhancing handling and stability even more. On top of that, Edgewater uses a technique they call “Single Piece Infusion,” or SPI, to lay up the hull and stringer system. Vinylester resin is infused through both the hull and the stringer system at the same time, in one process, instead of laying up the pieces separately then bonding them together. All of the resin cures at the same time, and the result is a single-piece structure. According to Edgewater, the piece is up to three times stronger than some traditional lay-ups. I didn’t have an impact-o-meter (more commonly known as a sledgehammer) when I ran the boat, so I couldn’t put that claim to the test (and I’m pretty sure they wouldn’t want me banging away on the hull of their new boat anyway). But crossing two and three foot boat wakes at 65 MPH gives you a pretty good feel for how stout a boat is, and in this case I don’t hesitate to say that the 368CC feels granite-solid as it goes chopping through the rough stuff. 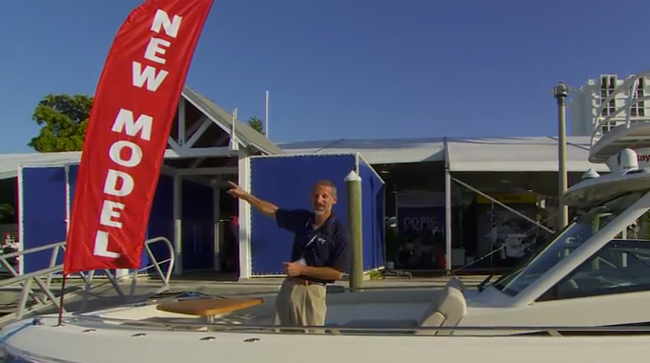 So if the boat is super-light, super-strong, and runs great, why doesn’t everyone looking for a 30-something center console buy a 368CC? The biggest downside is simple: cost. Building boats like this isn’t cheap. I wish I could give you a ballpark price, but when asked, Edgewater said “This is a customizable boat, we prefer not to publish a number but refer readers to their local Edgewater dealer.” Draw your own conclusions. Yes, this is inside a center console, but the cabin in the 368CC is quite roomy and comfortable. Anglers looking at the 368CC will also have to give a little bit in the fishing department. Yes, this is a center console, but like many in its class the console has been expanded quite a bit to make room for a comfy, air-conditioned cabin. It has a full-sized berth, a small galley, and a head. But walking around the sides of the console you won’t find more deck space than you’d find on many smaller center console boats. There are also some accommodations made for comfort in the bow area, which has seating on either side and a table which can serve as a filler, turning the bow into a sunpad or casting deck. It’s a comfy, well thought-out arrangement, but some blood-and-guts fishermen would prefer wide-open fishing space. Otherwise, the 368CC is well-armed for your fishing mission. The transom houses a 45 gallon livewell, a pair of 200-quart integrated, insulated fishboxes live in the deck, there’s a bait-prep station with a sink in the transom, fresh and raw water washdowns, and a concealed anchor with a windlass in the bow. 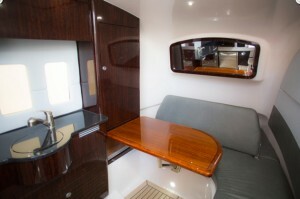 The boat also has a lot of fine details that may not jump out at you upon first glance but make for a better boat. The windshield, for example, is a custom frameless design that eliminates glare without distorting your view, even when you look through the curves in the sides. A low-profile grab rail rings the inwales, from bow to stern. A pair of blue LED underwater lights come standard (note to Edgewater: the greenies attract more fish, though something tells me you'd change this up if a buyer asked). And the Edson wheel comes with a suicide knob. Test conditions: Calm seas, 2 POB. Performance data provided courtesy of Yamaha. Power Triple Yamaha F300 four-stroke outboards. I put that knob to good use, when it was finally my turn to take command of the 368CC and put this boat through its paces. I zigged, I zagged, and I zoomed. More importantly, I smiled—and I’ll bet you will, too. 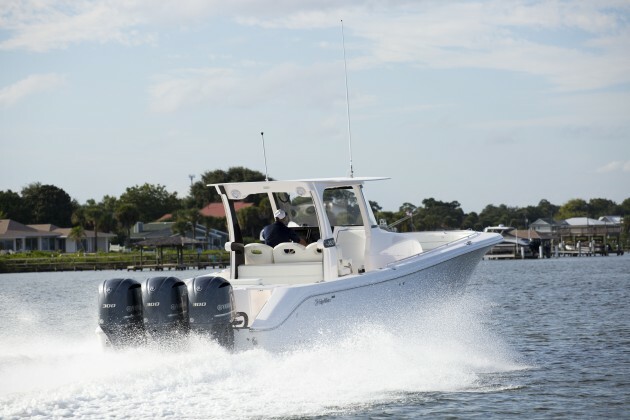 Other Choices: The Everglades 355T we mentioned earlier is a head-to-head competitor; it has similar performance with triple F350 outboards, is also incredibly well-built, but leans a bit more towards fishy and a bit less towards comfy, eschewing the forward seating for deck space and keeping the console (and cabin) more svelte. 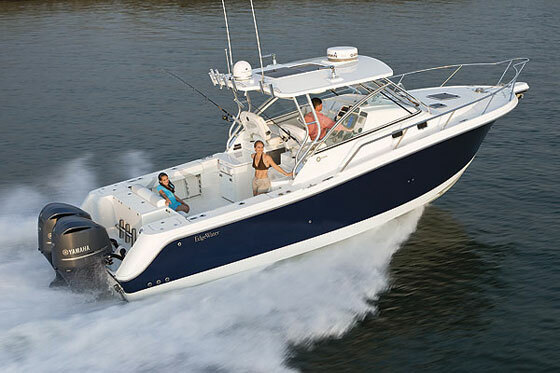 Those looking for more comfort and family-friendliness (at the expense of some fishability, of course) may like the Grady-White Freedom 335, which has a dual console layout with cabins to each side. For more information, visit Edgewater.